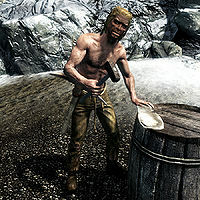 Lond is a Nord miner and is one of the many workers at the Quicksilver Mine in Dawnstar. He spends his entire life working the mine and never even pauses to eat or sleep. Between 7am and 7pm he can be found working the smelter outside the mine; the rest of the time, he uses his pickaxe inside the mine. He wears a pair of ragged trousers and a pair of boots, and is equipped with a pickaxe. He carries a selection of lower class loot and gold. His whole life seems to consist of nothing but mining and smelting and he will not hesitate to let you know when he remarks "I mine. Work the smelter. Ain't much else to tell." Whether due to working too much or Dawnstar's common nightmares, he gets very little sleep, and will tell you "If I get any rest soon, I'll count myself richer than a king." Lond: "If you don't mind me saying, Leigelf. You're working too hard. Go home." Leigelf: "Never. Not until we turn this mine around, drive Beitild out of business, and force her to apologize to me for everything she's done!" Lond: "What is this feud you have with your wife? What started this?" Leigelf: "I don't want to talk about it." Lond: "You don't want to talk about it, or you don't know?" Leigelf: "Thank you for sticking by me." Lond: "Where else would I go? Dawnstar is my home and working here is my job." Leigelf: "It's good to hear you say that. I wish my wife was as simple as you." Lond: "I'll, uh, just take that as a compliment." According to the Creation Kit, his full name is Lond Northstrider. This page was last modified on 30 August 2015, at 14:22.